In Santa Cruz County, it is reported that less than five percent of the mature Western black-legged ticks and a somewhat higher percentage of the nymphal (baby) stage, carry the Lyme bacteria. 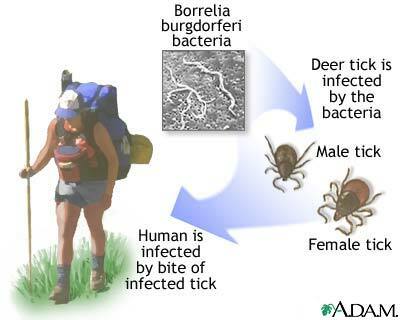 Although many people worry after being bitten by a tick, the risk of acquiring an infection is quite low. In this article I’d like to discuss the tick bite and signs and symptoms of Lyme disease. Neither the tick’s body nor its head burrows into the skin. Instead, the tick attaches by its mouthparts. An infected tick can transmit an infection only after it has been attached, taken blood from its host, and fed for 24 to 48 hours. If you find a tick on you that is unattached and non-engorged, it is unlikely to have transmitted an infection. Look carefully for the immature nymphal ticks, which are the size of a sesame seed. It helps to shower after clearing brush or walking in wild lands. The proper method of removing a tick is to use a fine pair of tweezers and grasp the tick as close to the skin as possible. Pull it straight out, gently but firmly, without jerking or twisting. After removing the tick, wash your hands and the skin around the bite thoroughly with soap and water. If, after removal, you see anything remaining in the skin, this represents tiny mouthparts of the tick. It is not the tick’s “head” and it cannot increase the risk of transmission of Lyme disease once the tick body is removed. If you are unable to remove the mouth parts easily, as you would a splinter, leave it alone and the skin should eventually heal. If you are concerned see your doctor. The actual Lyme’s rash, called erythema migrans, is reported to occur in up to 80 percent of infected tick bites. It is described as a red rash that is usually neither itchy nor painful. It develops a few days to a few weeks after a tick bite and is likely to be the first sign of Lyme disease. The rash most often continues to get larger over a period of time and will grow to be well over 2 inches, possibly 8 to 12 inches or more, and may last for several weeks. This rash may sometimes develop a pale appearance in the center, causing a bull’s eye shape. Either during the time of the rash or shortly thereafter, other symptoms of Lyme disease may appear which resemble these common flu-like symptoms: fever and chills, malaise (achiness), headache, and achy joints. The rash and/or the above flu-like symptoms may indicate early Lyme disease and you should see your doctor. When recognized during this early stage, most infections can be adequately treated. If the above symptoms do not occur, are not recognized or are not treated properly, then one might develop late Lyme disease which can more severely affect different parts of the body such as the joints, the nervous system, and the heart, to mention a few. The bottom line is that whether you are aware of a recent tick bite or not, if you develop an unusual, unexplainable rash or if you develop flu-like symptoms (without respiratory symptoms), especially outside of the flu season, you should visit your doctor and discuss the possibility of Lyme disease. In my most recent column, I discussed the topic of rabies, especially what one should do if bitten by a possibly rabid animal. Now, I would like to describe animal bites in general. The law requires that the local animal control office be contacted when any person or animal is bitten by another animal, whether the biting animal is wild or domestic. 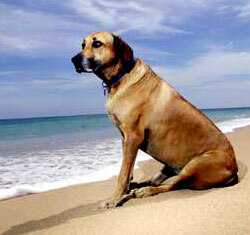 The phone number for the local Santa Cruz animal control office is 454-7303. When a bite victim seeks medical treatment, the treating physician must also, by law, fill out an animal bite form and send it immediately to animal control. That is true even if the bite is from one’s own pet. An animal control officer will investigate and advise the animal owner about quarantining the animal, which is usually done at the owner’s home. Regardless of the animal’s vaccination history, it will be observed daily for 10 days following the bite for signs of rabies. If the isolated dog or cat is deemed healthy after 10 days, there is no risk of rabies from the original bite wound, and the bitten victim will not need to undergo the series of shots to prevent rabies. More than 3 million animal bites are reported each year. Emergency rooms see 300,000 animal-bite-related visits each year, costing about $160 million. Eighty percent of bites are from dogs, 10 percent from cats and remaining 10 percent from other animals. Children are the most frequent victims of dog bites, especially boys between 5 and 9 years old. At least 50 percent of dog bites are from a family dog or a dog belonging to a neighbor. Men are more frequently bitten by dogs than women (3 to 1), and women are more frequently bitten by cats (3 to 1). Dog owners should be aware that many homeowner insurance policies will not cover certain biting-prone dog species and will often drop coverage or increase premiums after a single dog bite. In general, dog bites cause less infection than cat bites. This is because dogs’ teeth are duller and less able to penetrate the flesh deeply, while cats’ teeth are sharper, proportionally longer and able to sink deeper. Infections are often evident after fewer than 24 hours. Bites to the face, although cosmetically worrisome, are least prone to infection, and bites to the hands and fingers are most likely to become infected. **The wound is gaping (wide open). **You have a weakened immune system. **The wound already appears infected. **You need a tetanus booster. I want to emphasize that if you have suffered what you believe to be more than just a superficial to bite to the hand from any source, be it a dog, a human, or especially a cat, see your doctor for wound evaluation and treatment as soon as possible. You will most likely be treated with antibiotics before an infection develops. Hand infections — especially from bites — may be a cause for hospitalization if not treated promptly and aggressively.